The eDrive test system from HBM will be demonstrated at Millbrook in December combining mechanical and electrical testing. HBM will be exhibiting its powerful new product for eDrive testing, together with a range of data acquisition systems and sensors on Stand 220 at this year’s Automotive Testing Show on the 8th and 9th December. Taking place at the Millbrook Proving Ground in Bedford, HBM will be exhibiting its state of the art range of vehicle mounted test equipment to demonstrate the capture of data in real testing scenarios within the automotive industry. HBM will be exhibiting models, such as the eDrive test rig for display of electrical and mechanical motor efficiencies and losses. Also on display will be a motor test bench, which displays measured values of torque, displacement and pressure using the T22 torque transducer, WI displacement transducer, P8 pressure transducer and QuantumX Data Acquisition System. The innovative eDrive Test System from HBM is a robust, integrated system for measuring the performance and efficiency of electric motors and inverters. The eDrive testing product combines HBM’s T12 or T40 Torque Sensor, the most accurate torque transducers in each respective class; the GEN3i Data Acquisition System; and, as an option, the Quantum 1609B Temperature Satellite, to provide synchronous, dynamic and continuous acquisition of mechanical and electrical signals from an electric drive system. In addition to making temperature, torque and rotational measurements, the eDrive from HBM can also make measurements from as many as 18 current and voltage channels at voltages up to 1,000 V, at a sampling rate of up to 2 ms/s. Furthermore, the system incorporates an intuitive eDrive software GUI which has been developed exclusively for electric motor and inverter testing and for noise immunity. In addition to providing raw data, the new system from HBM provides real-time results, such as true, reactive and apparent power and efficiency calculations. “HBM’s eDrive package is the only completely integrated test system on the market that allows engineers to record, verify and study both electrical and mechanical parameters under dynamic conditions”, comments Mike Hoyer, HBM Applications Engineer. Visitors to the stand are invited to take a closer look at some exciting demo models, which include a scooter strategically fitted with HBM sensors and strain gauges to measure bending, tension, compression and temperature. Also on show will be an eye catching Ferrari toy car demo model. Fitted with a QuantumX MX430B amp module for force, torque and pressure measurement, this model exemplifies how accurate and sensitive measurement results can be achieved by utilising HBM technology. As test engineers require highly precise and repeatable test results, which often need to be acquired in adverse and harsh conditions, testing vehicles can often present a challenge. 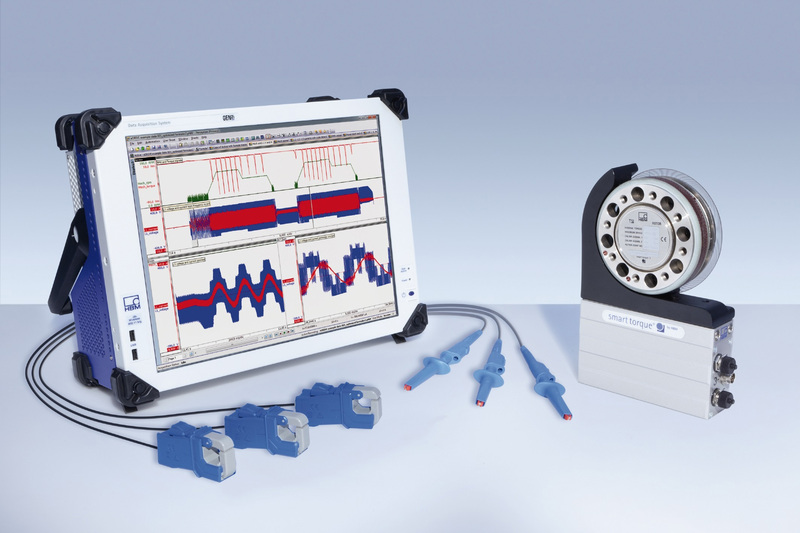 However, with more and more emphasis being placed on improving performance, the need to utilise a modern data acquisition system which offers a reliable and robust measurement capability, which can be easily adapted to perform a variety of measurement tasks, under a variety of conditions, seems to be the most obvious method – good measurement data is, after all, essential for optimising designs.